A mommy blog, subscription box review blog, entertaining blog, weight-loss blog, and babble blog. With a side of wine. 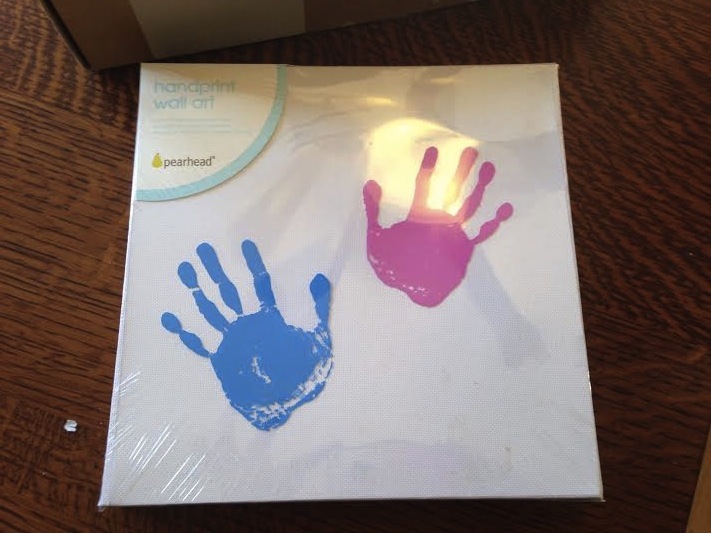 Pearhead Handprint Art set: ($10?) The only ones like this I can find online are for sets of four of these for $24, so I am calling this one $10. (speaking of which, websites without a search function drive me nuts) This comes with the canvas, paint and tray for dipping hands in. I already know who we are gifting this, to. My mother-in-law will probably really enjoy making this with D over the holidays to hang on her wall. She likes crafty stuff and she likes him, so I think it will be a hit for the little gift exchange we are doing while we are in California. 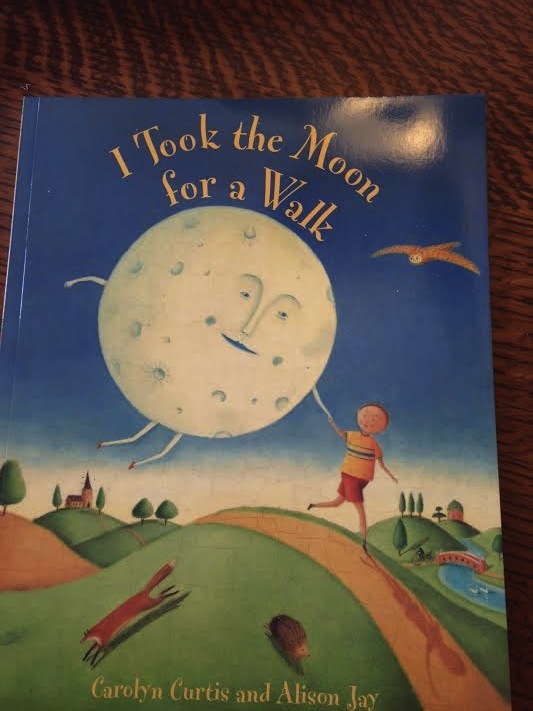 I Took The Moon for a Walk: ($7.19) This is a great little book, and while D is currently into about four books that are the only ones he will even think about reading, he always changes his selections eventually. I think this will work its way in there soon. I always like getting books in kid boxes. 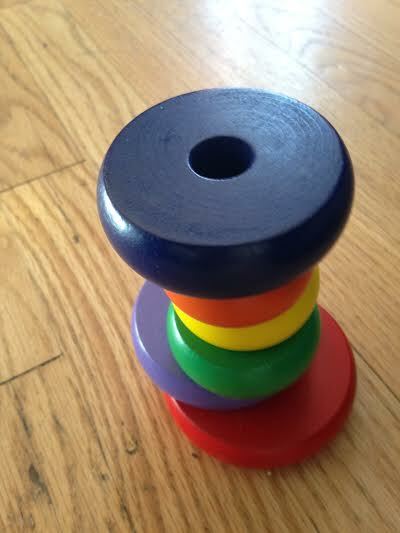 Melissa and Doug Stacker: ($7.99) This was the item that D pried out of my hands whilst I was trying to get a photo, and so here is the photo I could get of it. Already missing a couple pieces and stacked on our hardwood floors (which are just old, not dirty…well, they are probably dirty, too, but mostly just very lived on in our 100 year old house) I got this same stacker in our Bluum box last month (you can find a better photo in that review), and so that one, which I managed to hide unopened will go to D’s school so all the kids can use it. He loves this, and Melissa and Doug is a favorite brand around here. Snuggly Lotion from Episencial: ($9.00) The link is for the 8 oz, but the size that was in the box was the 3.4 oz. We love this brand, too, and extra lotion is always handy for everyone in Colorado. We slather the kid nightly with it, so it is always nice to have more good quality lotion to spare. Um, that is it. This was not my favorite Citrus Lane box. There was no mommy item this month, and most of the items were things I had seen before in Citrus Lane boxes. I like the brands, but part of why I like boxes is to be introduced to new things that other moms might not know about yet. Last month’s box was a much better mix. All told, I calculate the value to be around $34. Not terrible, not amazing. What did you think of your Citrus Lane this month?